Silvery, spiny-rayed elongated fish with several dark horizontal streaks along the sides. Back is blue-gray with silvery reflections. Sides are silvery with a faint blue-green tinge and several horizontal olive-gray streaks. Upper surface of the tongue usually has a single, heart-shaped patch of teeth. One of only two species of sea bass (yellow bass are the other) native to Missouri . One of the most important game fish in Missouri’s large impoundments. Most closely related to yellow and striped bass game fish. Total length: 9-15 inches; weight: 1/4 to 1 1/4 pounds; maximum about 17 1/2 inches and 2 3/4 pounds. Inhabit the deeper pools of streams and the open waters of lakes and reservoirs. Most active at dawn and dusk. Hybrids of the white bass and the non-native striped bass have been stocked in several Missouri reservoirs to help control populations of gizzard shad. Carnivorous, feeding primarily on fish, but also on aquatic insects and crustaceans. 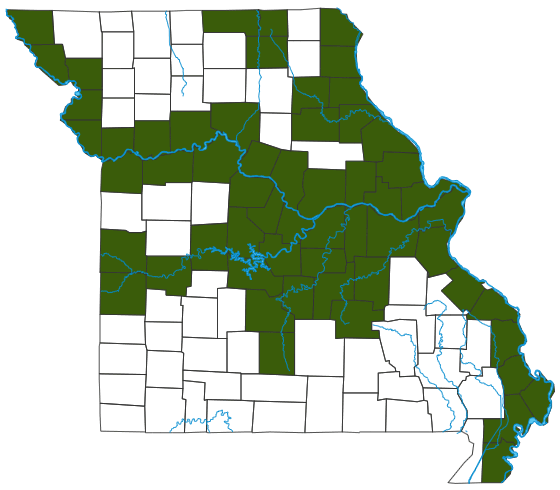 Occurs in the Mississippi River and its principal tributaries; also in most large Ozark reservoirs (due to introductions) and in the Missouri River. Individuals can live about 4 years.